The joint venture will develop exclusively both partners’ offshore activities. Gamesa and AREVA signed binding agreements for the creation of a joint venture in the promising offshore wind energy industry, culminating the exclusive talks initiated last January. The new company will be ideally positioned to become a leading player in the offshore wind segment with a 2.8 GW pipeline and the objective of garnering a market share close to 20% in Europe by 2020. The closing of the transaction is expected to be secured by the fourth quarter of this year, subject to approval by the French government and the relevant competition authorities in Europe and other jurisdictions. The 50/50 joint venture will combine both groups' offshore businesses: technological and manufacturing expertise and extensive track records in the wind industry. Areva has succesfully developped a dedicated offshore wind turbine since 2004, reaching a 630 MW offshore installed base by the end of 2014. while Gamesa brings its technological know how, underpinned by a 20-year track record in the entire value chain. Its 5 MW offshore platform. Offshore R&D knowledge transfer and license of the onshore technology which can be applied offshore. Extensive Operations & Maintenance prowess, with 20 GW of onshore capacity under maintenance. Its industrial know-how and supply chain access, both of which are key to cost streamlining. Its 5 and 8 MW offshore platforms. A 2.8 GW pipeline, the offshore market’s second largest. Offshore R&D and engineering knowledge transfer. Dedicated offshore manufacturing and logistics capabilities, specifically its industrial and logistics centres in Bremerhaven (turbine assembly) and Stade (blades), both in Germany. In addition, the agreements envisage making Gamesa a preferred supplier of parts to the joint venture. The new company will be ideally positioned to become a leading player in the offshore wind segment: it expects to garner an expanding market share in Europe by 2020, underpinned by its pipeline, with projects in Germany, France and UK. Europe is the main offshore market, where installed capacity is expected to exceed 25 GW in 2020. From the outset, the joint venture will boast numerous committed customers amongst which Iberdrola and the GDF Suez-EDPR-Neoen Marine consortium. The joint venture is also well positioned, thanks to both partners' extensive track records to take advantage of the high-potential of the Asian market, where forecasts indicate an installed capacity of 18 GW within the same time horizon. The joint venture will have two 5 MW platforms, which will allow the new company to address market requests with greater flexibility. 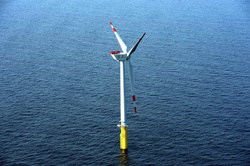 It will work on the optimization of the AREVA's M5000, as well as Gamesa's 5.0 MW offshore turbines. The joint venture will also further develop its upcoming 8 MW platform, in order to continue to be a driving force in lowering the levelized cost of energy of offshore wind. The joint venture will benefit from the recently won 1 GW pipeline in France's offshore round 2, where the 8 MW is set to be installed by 2021. The JV will fulfill existing industrial development commitments both in France and UK, that have up until now been led by AREVA, which notably include the creation of a turbine assembly and blades manufacturing plants at Le Havre and the implementation in France of a network of sub-contractors and partners. The joint venture will have registered headquarters in Zamudio (Vizcaya, Spain), while Executive Committee will be based in Paris. The Board of Directors will have eight members, four appointed by each of Gamesa and Areva. Xabier Etxeberria, Gamesa's Business CEO, will be the joint venture's Chairman of the Board. The new company's General Manager will be Arnaud Bellanger, current Executive Vice President of Offshore Wind at AREVA.